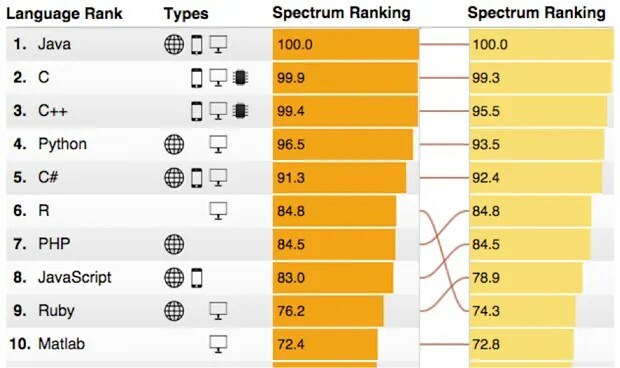 It depends on a number of factors, but if you want to decide solely on popularity, then you need to see this: The Most Popular Programming Languages of 2015 | ProgrammableWeb. At the top you have some consistency, with Java at the top, and C, C++ and C# in the top five. Python, a language that I am becoming fond of and using to replace Perl, is up there at #4. What is interesting, and not shown, are new and up and coming languages, such as Swift. I expect that to inch into the top 10 in the next few years. If you want to focus on learning a programming language, and you have no other criteria, pick something from this list. Before you take hold of the beautiful weight, you read the stories written and listen to the tales told of holding on to it. But life is short, and when you are offered it, you are more afraid of refusing it than you are of accepting it. You fear you will never get the chance again in your life, long or short, of having the beautiful weight. You see so many others, weightless and unbearably light and that seems worse than the load. You step forward and shift the heavy beauty onto your back, and as you stumble forward, you experience the pride and panic of such a possession. The days and months and years will pass, and through each of them you will rise up and shoulder the weight throughout each hour, retiring it briefly each night. If you are lucky, you will have a string of Hercules who will shift it onto their shoulders, however briefly, giving you a moment’s rest. Many unfortunately know no such solace, and the sublime burden falls solely on their backs. The truly unfortunate are unable to walk steadily forward and eventually lose their footing, stumbling off the path, into the waters. Unable to let go, they go deeper and deeper down into the water, struggling to keep their head above the surface as the weight submerges them. Only those unworthy of the beautiful weight are able to slip out from under it. The rest get stronger from their struggle, or drown. They say out loud that the beautiful weight makes life worth living. Afterwards they whisper something else. There is an art to carrying the beautiful weight, and though it is the most important of the arts, it is rarely taught. They will learn as they go, they mutter, and either sink or make do. And many make do, while some struggle terribly and then float quietly beneath the surface. If you are trying to use iTunes on Windows and you can’t, you may have to disable your firewall. Seriously! I tried a number of things, and I finally came across this, Resolve issues between iTunes and third-party security software – Apple Support, as well as some other sites, and once I did that, I was able to get it to work. If you are unhappy with that, your next best option is to methodically follow this and poke enough holes in your firewall to work. That’s the safer route, by far. This piece may be the stupidest defence of Amazon’s workplace practices: Replace Just 2 Words in the New York Times Amazon Article and Something Amazing Happens | Inc.com. Amazon employees are not entrepreneurs. There is nothing in the NYTimes.com article that gives any inkling that they are. If anything, they have all the downside of being an entrepreneurs with little if any of the upside. If someone can point out an article showing how Amazon consistently rewards employees as if they are true entrepreneurs, I’d love to read it. There’s nothing wrong with being an entrepreneur. In fact, for some people, being an entrepreneur is the best type of work there is. Everything about it appeals to them, and working for a large corporation would kill them. The Amazon employees are not entrepreneurs. If you want to be an entrepreneur, be one. Don’t try to be one working at a large corporation. That is antithetical to what being an entrepreneur is. Over at Vox is your typical article critiquing multitasking: Multitasking is inefficient. Here are 6 tips for a more productive workday. – Vox. If you do a search on the word multitasking, you will find similar articles. Like the Vox piece, they are all reasonable, and they all offer good advice. We have too much to do in the little time you have. The tools we use are not responsive and/or support multitasking. You will be penalized for not appearing busy. To give you an example of what I mean, consider your day. You likely have too much to do and not enough time to do it. Now let’s look at the tool you have at hand in an office. First, you have a computer and you use software like email and your browser. With email, you can start a number of tasks, but you cannot complete them. With your browser, you ask for information, then you wait for a response. If you are using a mobile device, a similar lag in request and response occurs. Now, you could just sit there and wait for a response to complete your task, but remember, you have too much to do and not enough time. As a result, you start other tasks. You are ….multitasking. You are maximizing your idle time while you wait for tasks to complete. Now you could just sit there, look out the window or go for a walk, but that would be ignoring the third point, which is that you will be penalized for not appearing busy. If you are fortunate, you can focus on one task, complete it, and then move on to the next one. If you are like most of us, you have to multitask for the reasons above.